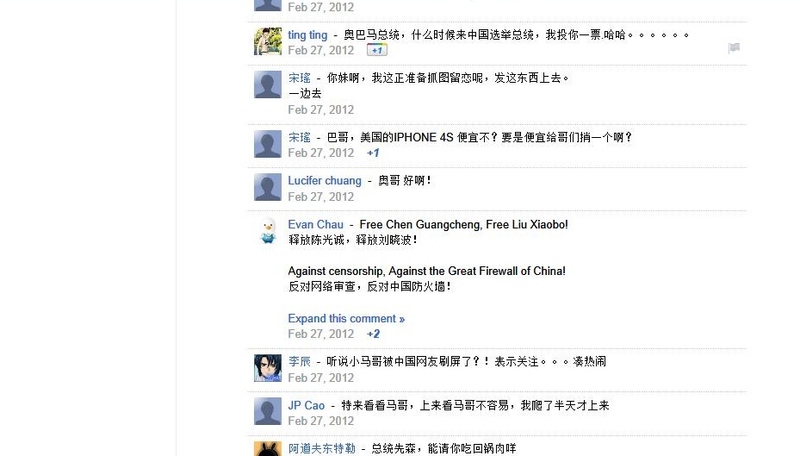 Earlier this week, out of nowhere, netizens in China found G+ was accessible and some began to post comments on President Obama’s campaign account making appeals such as “Free Chen Guangcheng.” By now all the rowdies have shown up, and I had difficulty cutting a screen shot with a CGC message on it. What a pity. This week, the annual National People’s Congress (NPC) and National Political Consultative Conference are getting ready to open on March 3rd and 5th respectively, and it is also the time of the year when online satire and sarcasm are at their thickest. Also this week, the latest spasm of “Learning from Lei Feng” campaign went full blown on state media, but this time around, thanks to the existence of Weibo, the deconstruction of Lei Feng by netizens is ruthless, overwhelming, and thorough. Click date below item for link to the original. 北风（温云超）‏@wenyunchao/(social activist, advocate of social media)/: A more apt description of the “Occupy Obama” phenomenon on G+ would be: the Chinese netizens take every possible opportunity to express their contempt for, and shame of, their country’s rulers. 蒲飞‏@pufei/(netizen who maintains the human rights website Tianwang in Chengdu)/: Next week, parent associations of top European and American universities will convene in Beijing. So will a summit of high-end clients of overseas banks. 王冉/Wang Ran/(Investment banker)/: To try to solve the problem of moral bankruptcy with Lei Feng is like restoring virginity with a band-aid. To rebuild China’s moral system, people have to have faith, the nation has to have rule of law, power has to be caged, and the government has to be confined within borders. 人海骈民‏@jianjian5614/Ran Hai Pian Min/(netizen)/: Zhang Jun, the propaganda clerk whose job was to photograph Lei Feng, recalled that, to establish this role model, the Shenyang Military Zone formed a photography team and a diary assistance team for Lei Feng. Over the course of more than two years, the photographer team took 300 plus pictures of Lei Feng, averaging one picture every three days. 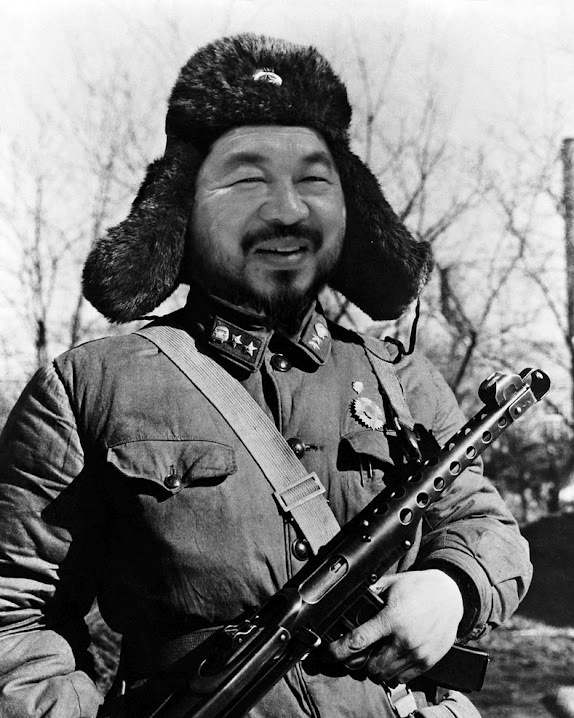 This is the truth behind Lei Feng the anonymous do-gooder who happened to have left a lot of photos and diaries. But it is only in recently years when the public has had access to internet freedom, although limited, that more truth about Lei Feng has been discovered. 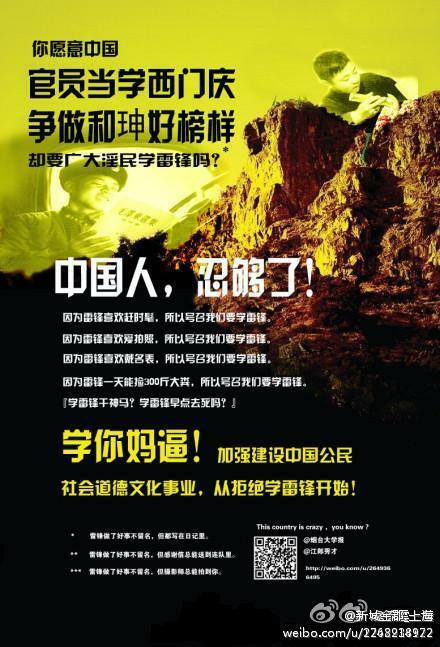 林奇99 /Lin Qi/(teacher, author)/: It is not so much Lei Feng, or the Learn-from-Lei-Feng campaign, that irks people. On the contrary, the public’s desire for a moral society is stronger than ever. What’s repulsive is the absurdity of the attempt to use power to alter the moral landscape, the appropriation of Lei Feng as a move in a political game, the fact that those who call for learning from Lei Feng are themselves doing the opposite. Take a listen to the song “Learn from the Good Example of Lei Feng”, written in 1963 and available now on websites of the Youth League and party apparatus. The Chinese have had enough! To rebuild the moral and cultural foundation of the Chinese citizens, start with rejecting Lei Feng as a role model! By T in Uncategorized on March 4, 2012 . It’s odd that the Party does not focus on real, live heroes. Why focus on someone who lived 50 years ago who arguably was made up by propagandists? Have there been no moral heroes since then? How about the street vendor who picked up Yue Yue, the little girl who was hit by the truck in Foshan, or the astronauts or the various PLA soldiers who help citizenry in times of crisis? Good compilation this week, Yaxue. @Lao Why, some of those figures are used, astronauts most obviously, although it would be difficult to portray the messages of the Lei Feng legend through an astronaut. The street vendor, though, is a fine idea. I would think that it matters less who the hero is than the message that figure is deployed to carry. Even so, there are usually multiple messages. There are those that most of us have little trouble getting behind, such as the promotion of selflessness as in the case of Lei Feng. But that desirable message is always linked to the Party’s legitimacy past and present. My own take is that the Party is quite sincere in its promotion of a more “civilized” China and that message is consistent with its self-interest.